Whether you’re a grilling professional or a novice who’s just sparked an interest, you’ll find the gourmet outdoor cooking equipment and accessories you need here. 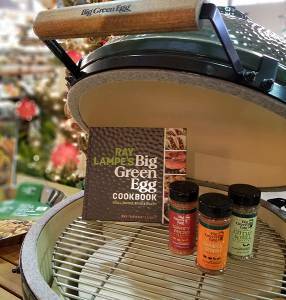 Big Green Eggs in all sizes are available to get you grilling “green,” as well as specialty smoking woods, planks, himalayan salt blocks, gourmet olive oils, barbecue sauces & rubs. If it’s inspiration you’re seeking, browse our collection of recipe books & peruse an extensive collection of grilling accessories. Join us for one of our Big Green Egg demo days to see Kentucky eggsperts in action, and put our annual Bluegrass Eggfest (held on the last Saturday in June) on your calendar! sign up for our email list and we’ll keep you in the loop on our upcoming events.